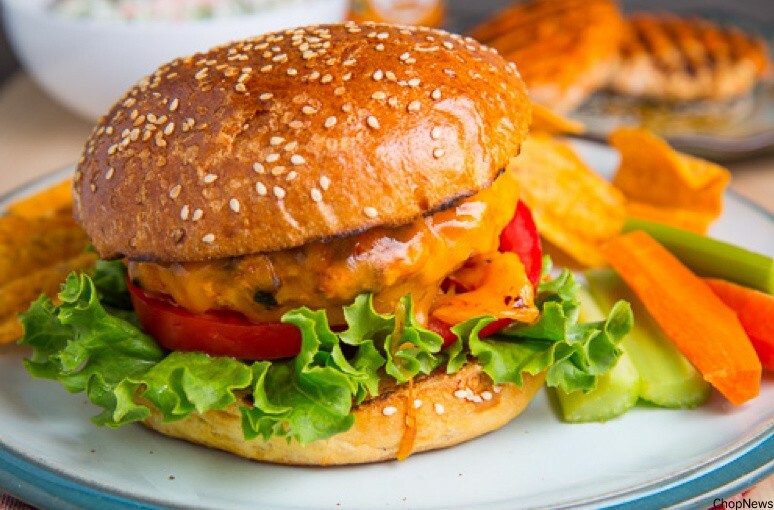 Learn How To Make Cheesy Chicken Burger To Satiate Your Taste Buds: Getting the influences from the western culture, India has been innovating its everyday chores and meals. From the times when we loved McDonalds to experimenting with Burger Singh, the flavors have grown into delicacies. Of them all, Cheesy Chicken Burger takes a special place in our tummy! How the melting chicken patty dissolves in the mouth and that extra cheese layer adds into the taste, stories of the pleasure evolved from food. How about creating the mouth-watering cheese burger at home? Curbs the expenses and satiates the taste buds. Crisp it, Melt it and Hog into the layers- Cheesy Chicken Burger! Our new generation is drooling over the accessible fast food dishes. If we, actually, dig into the creation of these dishes at home, we can literally save a genuine amount and also savor a proper quantity. So, taking one down from the lists of favorites, here we are with the recipe of making cheesy chicken burger at home. Cheesy Chicken Burger comprises of fresh sliced Onion, Tomatoes and Capsicum with a crispy chicken patty made with tender chicken breast, topped with a good layer of cheese and freshly baked buns. Did this just tingle your taste-buds? Let’s go on to make this yummy burger and satisfy the food lust. Follow the list of ingredients provided below and collect all the requirements to make it your delicacy. Please note that the given quantity is sufficient to make 6 regular sized burgers. The recipe to make this burger involves making of chicken patty and then assembling of all the major ingredients to present the dish. The overall time to create this recipe is 50 minutes which involves 40 minutes of cooking and 10 minutes of presentation. now, we are dividing our cooking into 2 segments, one where we will cook the patties and the second where we will move on to assemble the burgers. Add salt, pepper, 1 tablespoon of Greek yogurt and a handful of grated cheddar cheese. Also, you can also use egg yolk instead of Greek yogurt as the major reason is to add a binding agent to the mixture. Moreover, you can also Barbeque the patties or bake them for 15-20 minutes at 180 degrees. Make sure the patties are evenly cooked before placing them into the bun. Now, after your cheese chicken patties are ready, you can move on to make the burgers ready to be gauged upon. Take the burger buns, 1 at a time. On the bottom slice of the burger gun, spread some mustard sauce. You can use any of your favorite spread- mint mayonnaise, harissa, sweet onion etc. These burgers are best consumed hot. Tip: burgers and French fries are best friends. So, you can add French fries as sides and make some refreshing drink to make a perfect combo. Serve with a cheesy dip and savor the yummy flavors. Also, if you are one of those who loves to eat but hates to cook, then order your chicken burger under McDonalds coupons and save on the treat. It might be a universally loved fast food but excess consumption of such foods might be hazardous for our health. To escape any kind of hinderance, try making innovative patties using healthy vegetables and ingredients. The best part is that the burger patties can be formed using so many varied veggies and still taste amazing. Pick up your spatulas and create what your stomach relishes.